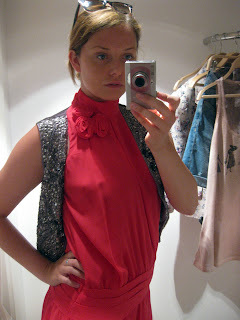 Today guest poster Lindsey checks out Zara on 34th Street. 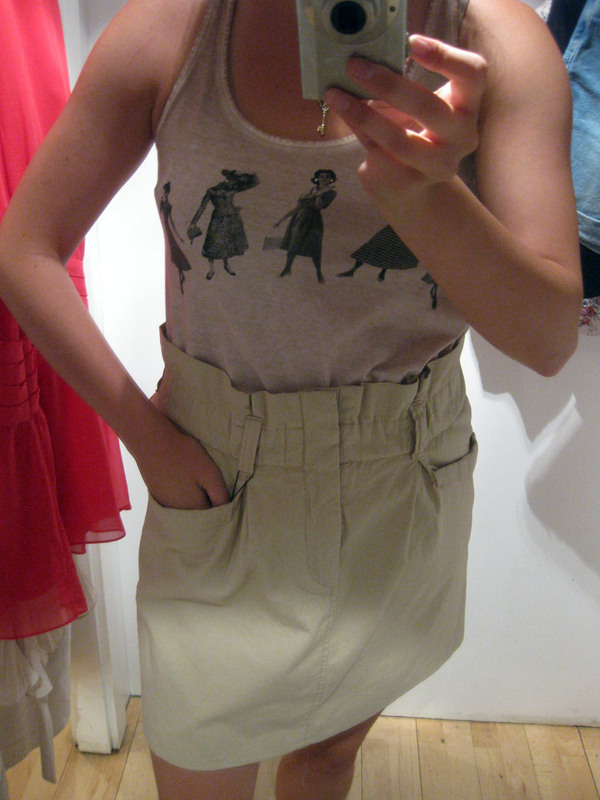 I must say, I had the most delightful experience in Zara the other morning! The colors, the prints, and the embellishments were right up my alley. First I fell in love with this floral print summer blazer ($99.90) and paired it with this delicate tan crepe halter dress ($99.90). 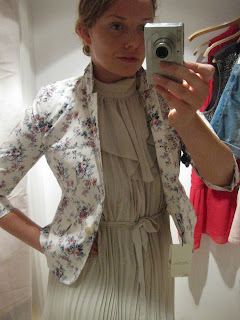 The combination has an Edwardian meets Pretty in Pink/Molly Ringwald feel to it. Next I found this lovely little fuchsia halter dress. 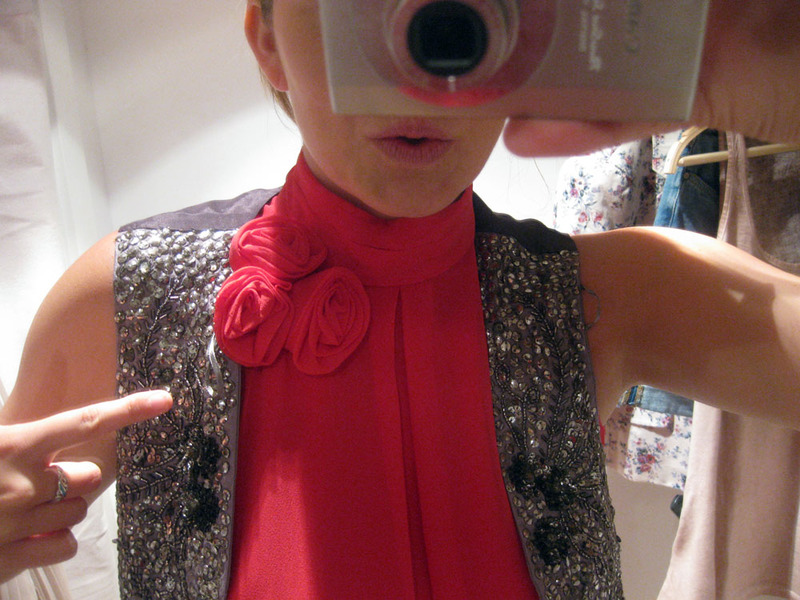 At first I was ambivalent about the “rosettes” huddled around the neck. It did have the “cute” factor of a Shirley temple curtsy that is hard to pull off beyond the tweenager years. However, I toughened it up with the addition of this gray embellished vest (below). Somehow the rosettes take on a more ironic role…something I find very appealing! Fuchsia crepe dress $99.90, gray embellished vest $59.90. After fully indulging in my crepe dress binge, I needed a more worn, rough-and-tumble feel. 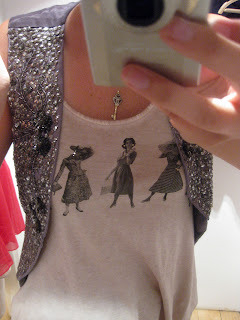 I looked no further than a muslin tank top printed with little ladies parading across the chest. I found this simply delightful. When paired with the gray vest, some long jean shorts, and tan sandals, I felt slightly boyish and feminine at the same time…what fun! Muslin tank, $39.90, jean shorts $39.90. The tank is so lovely you might find other uses for it as I have done with this simple, camel-colored high-waisted skirt ($99.90). Either way, if you are looking for some kind of summer sparkle, my bet’s on Zara.